This Is Getting Old: Target Practice! The Pens' scorers really came out swinging Tuesday night when they thrashed the Senators 7-4 to take their second straight road victory and take a 3-1 lead in the series. They followed up nicely on their victory Sunday with another solid team performance that saw 11 different people show up on the scoreboard for Pittsburgh. Though Ottawa did manage to get on the board, it was still a good game from Fleury who stopped 26-30 shots. Considering that 2 of these goals were 5 v 3 powerplay goals from Matt Cullen and Jason Spezza then it was actually a solid performance from Fleury. On the offensive note, the Pens managed to chase starting goaltender Brian Elliott after 4 goals and then put an extra 3 up on backup Pascale Leclaire. Evgeni Malkin kicked off the scoring by scoring the lone 1st period goal on the powerplay from a nice pass from Sergei Gonchar. Just when this looked to be a defensive battle, scoring exploded in the second. Less than 4 minutes into the second, Sidney Crosby took a nice poke pass from Chris Kunitz and beat Elliott to put the Penguins up 2-0. 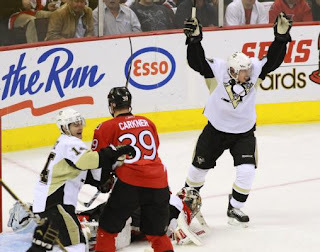 Just 12 seconds later, Matt Cooke scored to put the Pens in a commanding 3-0 position. Less than 3 minutes after that, Crosby scored again this time high side to put the Pens up 4 and chase Brian Elliott out of the net. The Senators were not yet prepared to go completely quietly though. Two rather quick goals by Chris Neil and Daniel Alfredsson cut the lead in half and Ottawa received yet another powerplay to cut the deficit to 1. That is when Max "Mr Playoffs" Talbot tipped in a Craig Adams pass for a shorthanded goal that would be the backbreaker for Ottawa. The Senators would score on that powerplay, but it would only be enough to bring the deficit back to 2. Chris Kunitz ripped one past Leclaire with less than 2 minutes left in the second to really put the Pens up huge. The teams would exchange goals in the third, with Spezza scoring for Ottawa and Jordan Staal scoring for the Pens and ending his small scoring draught. The Pens had no trouble lighting the lamp, and Elliott showed some rookie mistakes that Pittsburgh exploited well. It was a 4 point night for Sidney Crosby, who continued to amaze Tuesday night with his usual dazzling skating and puck handling. Chris Kunitz had a 3 point night, assisting on both of Crosby's goals and having Crosby assist on his. It is worth noting that this game did get quite chippy at times. Andy Sutton injured yet another Penguins, this time being Tyler Kennedy. Kennedy left the game early in the second, and did not return for the remainder of the game. There were also 3 Senators players that received misconducts, those being Chris Neil, Jarkko Ruutu, and Matt Carkner. I would not expect any of this animostity to spill over into game 5, though, as the Senators should be focused on getting themselves back into the series. The Pens currently lead the series 3-1 with game 5 Thursday night at Mellon Arena.